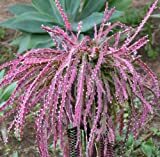 Lepismium growing epiphyte cactus of the genus Lepismium also known as Lepismium cactus, Lepismium perennial used as ornamental drought tolerant plant, can grow in tropics climate or as houseplant and growing in hardiness zone 13+. Stems color green or red shape is linear and can be: flat, round or polygon. Flower color can be: white, pink, orange or red, flowers can be flat or multi-petals and can grow next to each joint next to the spines.